Newly built in late 2001, our luxury villa is close to the heart of Orlando's world famous attractions, yet is situated in a peaceful, upscale, 24 hour monitored development, offering the perfect setting for your Orlando vacation. Close to an abundance of restaurants, shops and supermarkets, you will enjoy easy driving to all the area's attractions and beyond. The fully air conditioned villa contains all the comforts of home, has a South facing pool with a large deck area and is not overlooked at the rear - sunbathe in privacy! The villa is very spacious - larger in floor area than the average 4 bedroom villa - plenty of space to relax in after a long day at the parks! We have complimentary high speed Wi-Fi and free phone calls. Always striving to upgrade and improve our villa, in 2012 we placed all new furniture in the master and double bedrooms and in 2013 did the same for the twin bedroom. In 2014 we upgraded the entry system to keyless, providing each guest with a unique access code so there are no door keys to worry about losing and auto lock on exiting meaning the front door cannot be unintentionally left unlocked for your security. 2015 saw a new leather suite for the living room, a new A/C system and a complete pool refurbishment. January 2016, the whole house was re-carpeted in luxury super soft stain proof Smartstrand. 2017 saw a new dining table and chairs, new stainless steel kitchen appliances and granite worktops installed. We also recently invested in all new bed linens and pillows, new cutlery, crockery and utensils, iPod dock, indoor/outdoor grill, new pool light, fast wireless internet, free phone calls and an HD TV package inc UK football. FIRST TIME FLORIDA VSITOR? We now have as an additional amenity for our guests, a sat nav device, pre-programmed with all the destinations you could ever need! No getting lost, cut journey times and see more of Florida! We will do our best to help you in any way possible to plan your trip and can arrange with other owners for 4 bed villas next to us on the same development if a large group wish to travel together. Golf: Owner a golf fan! - email or telephone to discuss local courses and shops and how to get the best from a golf vacation. We are 5 minutes from Champions Gate, home of David Leadbetter's academy and close to Orange County National, home of Q school finals for the PGA Tour in 2003 and 2005, 2007 and 2010. Many other courses available locally to cater for a wide range of abilities, eg. Falcons Fire, Southern Dunes, Diamondback, Highlands Reserve, Orange County National, Champions Gate, Ridgewood Lakes, the 4 Disney courses, Providence, Eagle Creek, Grand Cypress, Shingle Creek etc. Myself, Jeremy and my wife Tracy, have been renting our villa for 17 years now. We met in 1991, married in 2004 and have 2 young daughters, aged 10 and 9, Abigail and Harriet. We live in Blackburn, Lancashire so any opportunity to see some Florida sun is welcome! 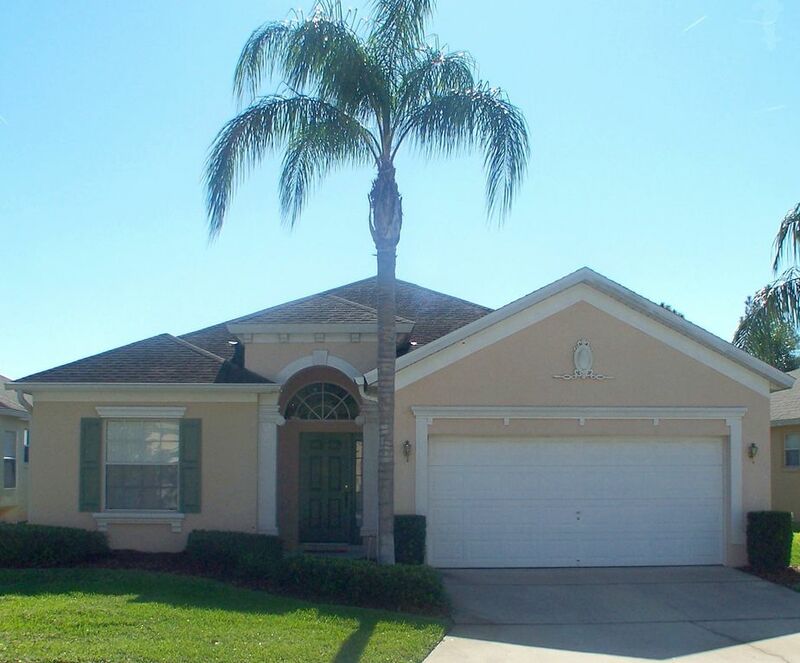 Our early years of villa ownership were spent really getting to know the Orlando area, visiting all the parks etc and gaining a depth of knowledge that we hope we can pass on to our guests in the form of good, sound advice and suggestions. This knowledge enables us to provide detailed information to the guest before arrival and helped put together a comprehensive information folder for guests reference in the villa also. Our latest trips have involved upgrading and enhancing the villa facilities to provide all those extra touches that make such a difference. The most pleasurable thing about our recent trips though is the expressions of joy on our little girls' faces - seeing Disney through their eyes is a wonderful experience. Meeting the characters with them, the water parks, the fireworks, the parades, Cirque du Soleil etc. all take on an extra dimension now. We're thrilled to be able to let them have such a privilege and their excitement and enthusiasm about Florida is beginning to match ours! Our second trip to Florida, July 1997 and on an early morning bus ride along US27 from our Kissimmee hotel to Busch Gardens, our driver mentions that frosts in the late 80's ruined the orange crop and now the groves are making way for homes. Tired eyed, we don't fully appreciate the significance of that statement. Fast forward to March 2001, and we are stood on a cleared piece of ground with a stake numbered 108 - this is our plot that is to become our pride and joy, our home in Florida. In 1999, we were stuck for holiday ideas - we decided to return to Florida as we never tired of things to do our first two trips-we'd got a flavour but not fully explored the area or played enough golf! Golfing at Arnold Palmer's Bay Hill Club led us to a chance pairing up with an American named Tom. Our love of golf bonded us in an instant. As guests of Tom and his wife in their Orlando home in 2000, on an early morning stroll around their neighbourhood, we realised that holidaying the American way in a residential area was far removed from staying in a hotel. The seed was sown, and after much research, our villa was purchased in March 2001. We were the first to stay there in November 2001. Calabay Parc was the only development we fell in love with, even though at first there were just a handful of homes built. But its potential and 'feel' was unmatched by any other- and our villa could be south facing with a private outlook to the rear and with an internal layout that suited us perfectly. Why is the villa the way round it is? We went for a 'garage right' orientation so the open end of the lanai is towards the sunset. 25 trips later, we still enjoy every minute at the villa - even when cleaning the windows or dryer vent! We only wish we could stay more often. The parks, restaurants, shops, golf, all keep us coming back for more and there is always something new to discover each trip. We hope that you'll feel at home and have a happy stay, hopefully on more than one occasion! Beautiful South facing location with a private rear outlook. Digital, keyless entry system. Our large sized lanai is a very comfortable place to relax and our swimming pool and is hedge screened to the sides for privacy. Spacious floor plan, a well maintained, air conditioned haven from the hustle and bustle of the parks. High speed wi-fi provided as are free phone calls. Quality towels and linens provided. Ceiling fans in all bedrooms, living room and lanai. TV's in living room, master bedroom and twin bedroom. Master has HD cable service including channels showing UK soccer. DVD player in living room and twin bedroom. iPod dock in living room and Bluetooth speaker. BBQ grill and George Foreman indoor/outdoor grill. Plenty of information given before travel and in detailed folders and guide books provided in the villa Efficient management company on hand for our guests 24/7. We strive to provide excellent customer service - just see our reviews! En suite master bathroom with His and Hers sinks, walk-in shower enclosure, large bath tub, separate WC. Guest walk-in wardrobe/closet in master bathroom. Second bathroom located between double and twin bedrooms with WC, sink, with shower over bath tub. Hairdryers supplied in both bathrooms. Linens and spares of everything inc blankets are provided. Washer and dryer in separate utility room. We provide quality bath sheets, bath towels, face flannels and pool towels. We also provide starters of Duck Island toiletries - soap, shower gel, conditioner and shampoo. Spacious living room with HD cable TV package, DVD player, Hi Fi system and iPod dock, book cases including comprehensive villa information folder and local guide books. Side-by-side US style fridge/freezer with both chilled water and ice dispenser. Above cooker, built-in microwave with over hob extractor and lighting. Our pantry contains items such as plastic pool crockery, large wheeled cooler for day trips etc. First aid kit. Games. Plentiful dishes, crockery and utensils are provided. Large, open plan kitchen, opens to dining area, overlooks breakfast area, door to utility room. Tiled floor. Phone with answering machine. Large dining table seating 6 people. Spectrum cable TV package including HD channels and UK soccer channels. We have a Harmon Kardon Bluetooth speaker and a JBL iPod dock. Pool toys, floats and noodles are provided. We have a variety of water shoes! Child sizes (UK) 8, 9, 10, 11, 13, 1 and 2, Men's size 8. Private pool, screened to sides by hedges, private rear outlook, heatable by arrangement. Large covered lanai area with 4 loungers, 4 chairs and round table, 2 small tables, towel drying stand. Daily maid service, pool heating and cot/crib all available by arrangement. I would highly recommend this villa to anyone. Booking was made very easy, the owner Jeremy could not have been more helpful both before, during and after our stay, he helped with our research and planning and any other questions we had. We had lots of details about the villa before we arrived, such as keyless entry instructions. The villa is a home from home, it’s very spacious, there is everything you need and more and everything is of good high quality. My children appreciated the high speed WiFi and other technology in the villa. Those added extras that Jeremy includes such as preprogrammed sat nat was used constantly and made such a difference to us. The pool deck is also as spacious and gives ample room for everyone and is not overlooked affording privacy. There is loads of extra towels and bedding and everything you could possibly need in the kitchen. There are some really good reviews about this property and the owner Jeremy and they are all absolutely true. We weren’t ready to leave and if we decide to return to Florida we will hope this villa is free. Many thanks for your review, Lisa and thanks for choosing to stay with us. Over the years, we've tried to provide as many little extras as we can for our guests, as we find those go a long way to making the stay more enjoyable and trouble free - the sat nav is a good example of this and we're glad you found it so helpful. It sounds like our passion for our home and Florida was evident throughout our communications! Receiving reviews like yours is very satisfying, knowing our guests enjoy our home as much as we do. Nevertheless, the constant research and updates, improvements etc. are always being thought about and my next maintenance trip in March (flying on Brexit day - we hope!) will see the usual round of works done - we like to keep on top of things! Suitcase is getting fuller, the Mickey and Minnie cups and plates were bought on Sunday, ready for our younger guests (and perhaps some older ones too) to enjoy. I hope we can welcome you back again sometime. Fantastic villa, everything you could ask for and an ideal location. This is a lovely villa, spacious and a very homely. Its situated in an ideal location to the Parks, Restaurants and Supermarkets, etc. Would definitely recommend to anyone. Hope we will be back as well. Thanks for the review, so glad you enjoyed your stay - I must say, this is a first, a review being posted before you've even set off for home! But appreciate any recommendations and I hope we can welcome you back again soon. Located on US27, our villa is a 15 minute drive west of Disney and is easily accessible from both the 192 and Interstate 4. Situated on a quiet, upscale residential development but within easy reach of all the area's world class attractions. Numerous shops and restaurants are 5 minutes away and 4 supermarkets are within a 10 minute drive. High quality golf in abundance locally also.